Home » For schools » Week 21: What’s Cooking? This week we read about the ‘sumptuous fare’ served up to cabin passengers onboard the Africaine. Gouger reports lavish meals of several courses, topped off with beverages and the occasional plum pudding. We also read that the dining and eating experiences of the intermediate and steerage passengers are quite different to those of our author. 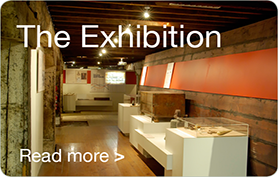 This week we will look at how all of this food was cooked and served on board vessels of this era. It must have been quite a challenge. 1. How were meals and meal times organised onboard? 2. 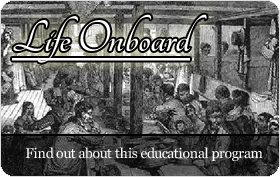 How did meals and meal times vary between cabin, intermediate and steerage passengers? 3. Examine the list of dishes served on the Africiane. What types of cooking utensils and methods would be used to prepare and cook these foods? 4. Gouger refers to a variety of animals onboard. How were animal products used in the meals provided onboard? 1. What types of stoves and ovens were used in England in 1836? What impact has technology had on cooking methods over time? 2. Meals were cooked in the ship's galley. What does a galley look like? In what ways are galleys on modern ships different? 3. What are the risks and dangers associated with cooking on ships? How are these avoided? How have the dangers changed over time? 4. How were people expected to eat and dine in England in 1836? Find out about table manners and dining behaviour in this time of history. Were the social rules and expectations the same for people of different social classes? Collect pictures of stoves, ovens and cooking equipment from different times in history. Sequence and order these pictures chronologically. Consider this chronological sequence in terms of technological developments such as electricity, plastics and microwave energy. Develop questions to help you research about fires onboard ships over time. Use online sources to research a famous ship fire. What caused the fire and what were the consequences for those onboard? How do we find out what happened on ships if there are no survivors? Gouger describes the beer, porter, wine and spirits as 'a la volonte' which he says is a French term meaning 'as much as you please'. Why would Gouger use a French phrase in his journal? How reliable is his interpretation of this phrase? Would a French speaking person use this phrase in the same way? Use an online translation tool to check the meaning of the phrase. onboard the Africiane. He is very complimentary about the meals he is served. How would passengers in steerage or intermediate cabins write about their meals? How do you think they would feel about the meals served to Gouger and his cabin party? Use a shoe box to create a diorama of a ship's galley or mess hall. Make sure your diorama includes the types of cooking equipment and utensils used for food preparation and meal times. 1. 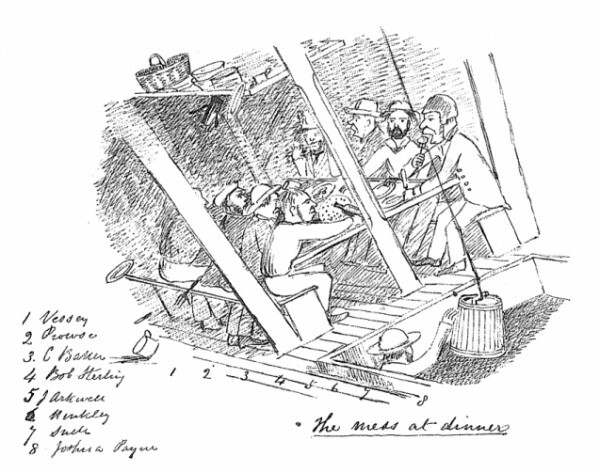 Work with a partner and read through Gouger's description of the food onboard the Africaine. Underline any words you are unsure of. Discuss the meanings of these words with your partner and come up with your own definitions. Compare your definitions with other pairs. Consult dictionaries and online sources to come up with an agreed definition of the words to be added to a class word bank or glossary. 2. Set up a display of kitchen utensils from a range of eras. Ask students to choose a utensil and suggest what it may have been used for. Is this utensil still used today? Has it been replaced by a modern utensil or was it used for a task that is not usually performed today? Can students design a more efficient utensil for performing this food preparation task? 3. Select a modern recipe from a cook book or website. If you had to cook this recipe in 1836 on a ship how would your equipment, utensils and cooking methods need to change? 4. Design a poster warning passengers of the fire dangers associated with cooking onboard. What strategies will you ask them to use to avoid a fire disaster onboard? Other than cooking what other activities, equipment or situations may pose a fire danger onboard? 5. Have a close look at the picture of passengers dining in a mess onboard a ship. Set up the classroom as a mess hall and hold a ship lunch. How will you work out who sits at each mess table? How will you serve the meal and how will passengers be expected to behave at the table? If possible cook the lunch on a wood fire, barbecue or campfire. 6. Make a list of all the ways to cook food that you can think of. Toasting, frying, baking, grilling, boiling, microwaving etc. Sort these according to the energy sources you need for each cooking method. If this voyage was happening in 2011 what types of cooking equipment and methods would be used onboard? How would this affect the types of meals that were served? Passengers would miss the meals they ate onboard after they arrived in South Australia. Aboriginal people learned a lot about cooking from the English people who arrived in 1836. It is easier to cook in a kitchen on land than in a galley at sea. Technology has made cooking easier. Next week we find all nine ships finally at sea. Passengers onboard the Africaineare becoming dissatisfied and starting to make demands. We'll take a look at how routines, rules and organisation helps keep life in order onboard. But does this work for everyone........................?